'Selfish Reasons' For Parents To Enjoy Having Kids An economics professor has a plan for raising children: have lots of them, and don't stress about nurturing their potential. 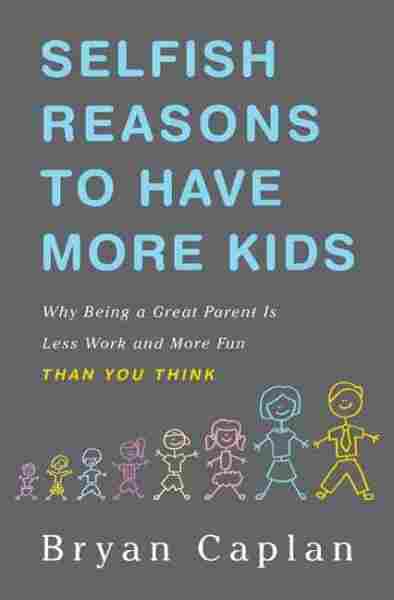 Bryan Caplan, author of the book Selfish Reasons to Have More Kids, says children's potential is helped most by a positive atmosphere. The long-term effects of parenting aren't proven, says author Bryan Caplan, seen here with his family. An economics professor has a plan for raising children: have lots of them, and don't stress about nurturing their potential. 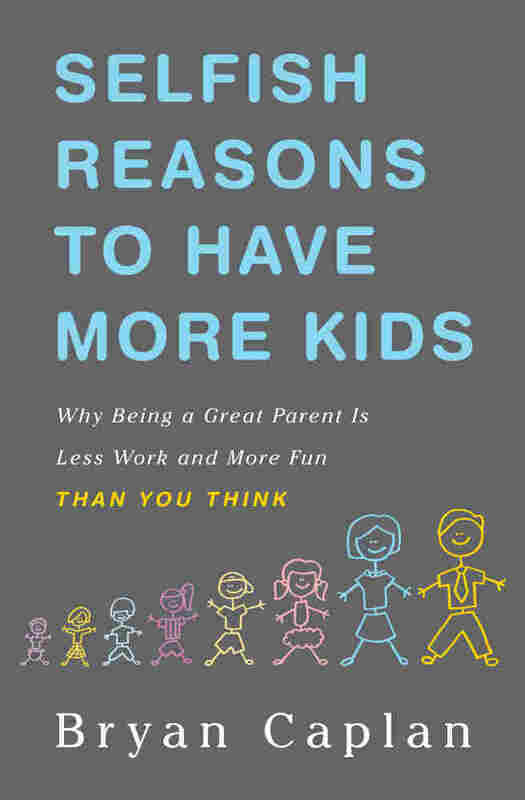 Bryan Caplan, author of the book Selfish Reasons to Have More Kids, says that a child is helped the most if they are in a positive atmosphere. And if they follow that step, Caplan says, parents can relax — and focus on having even more children. 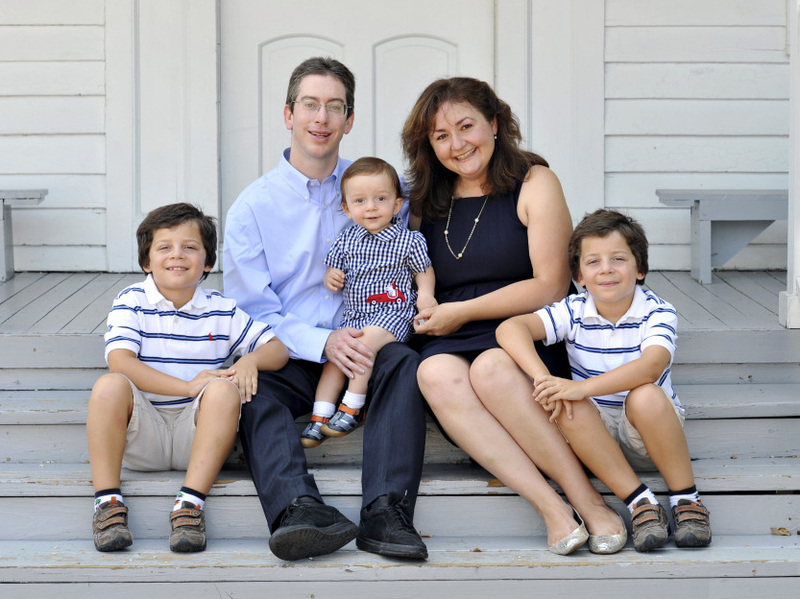 Caplan, who teaches at George Mason University, has three children himself — twin 8-year-olds and an infant. With his stories of children who watch lots of TV and play video games — and parents who let them off the hook instead of forcing them to pursue hobbies they hate — Caplan has been labeled the "anti-Tiger Mom" — a reference to author Amy Chua, the Yale professor who famously banned her daughters from sleepovers, play-dates or TV. As Caplan tells Morning Edition co-host Mary Louise Kelly, he feels that in some cases, being an attentive parent can make a child happy in the short-term — but that the long-term benefit of taking a more forceful approach is far from proven. "Go and talk to a 7-year-old boy," he says. "To them, kissing is the most disgusting thing on earth. And if it were normal to spend the next 10 years telling your kids, 'No, no, no, kissing is great, it's beautiful, it's wonderful' — and then, when they're 17, suddenly they change their minds. "We might think, 'Ah-ha! Finally got through to them,'" he says. "That's one story," Caplan says. "But a more reasonable story is, when you grow up you change — and parents wind up claiming credit for it." There is a cheekily subversive tone in Caplan's book, but he makes a serious argument about nature versus nurture. He cites studies of identical twins who were adopted by different families — but then went on to live very similar lives — as proof that the influence a parent can have on their child is overstated. And that goes for Chua, as well, Caplan says. Her book, Battle Hymn of the Tiger Mother, horrified some parents with its strict approach to demanding perfection from her children. "I don't think she is hurting them in the long-run," Caplan says. "But what I would say is that her parenting is not the reason for their success." DURING MY LIFETIME, THE AMERICAN FAMILY HAS DRASTICALLY downsized. Women in their forties are about twice as likely to have one child—or none—as they were thirty years ago. Big families have all but disappeared. In 1976, 20 percent of women in their early forties had five or more kids; by 2006, less than 4 percent did. If you ask people to explain why we don't have as many kids as we used to, the answers are all over the place. "People can't afford big families anymore," "Women have real careers now," "We don't need kids to help out with farm work," "Women want to live like men," "Americans have lost faith in God." In Athens, the Greeks blame air pollution. If you make the question personal, however, the answers are very much alike. When asked, "Why don't you have as many kids as we used to?" both men and women respond with groans. As best I can tell, the English translation of these groans is "Kids are a lot of work," or maybe "Imagine all the dirty diapers and sleepless nights," or perhaps "Are you trying to kill me?" To be brutally honest, we're reluctant to have more children because we think that the pain outweighs the gain. When people compare the grief that another child would give them to the joy that the child would bring, they conclude that it's just not worth it. As Bill Cosby put it, "The reason we have five children is because we do not want six." You could easily call this a very selfish outlook. How can you focus exclusively on whether another child would make you happier? What about the child? Unless your baby is truly unlucky, he will almost certainly be happy to be alive. Aren't you? This is your child we're talking about. If you have to make yourself a little less happy in order to give a son or daughter the gift of life, shouldn't you? The question is serious, but I'm going to dodge it. While I accept the natalist view that more births should be encouraged because they make the world a better place, asking others to sacrifice their happiness for the good of the world seems futile. Preaching against selfishness is usually about as productive as nagging a brick wall. When people weigh the costs and benefits of having another child, I'm not going to call them sinners for using a scale. The claim of this book, rather, is that current and prospective parents have accidentally tipped their scales against fertility. We may feel sure that the pursuit of happiness and kids (or at least more kids) are incompatible, but it is in the average person's enlightened self-interest to have more kids. That's right—people are not having enough children for their own good. Prospective parents need to take another look before they decide not to leap. Current parents need to take another look before they decide not to leap again. My theory is not one-size-fits-all. The claim is not that everyone should have lots of kids, but that the average person should have more kids. More than what? More than they were otherwise planning to have. If you live in a tiny urban apartment and love fancy foreign vacations, this might mean one kid instead of zero. If you live in a suburban McMansion and love theme parks, this might mean five kids instead of three. I'm here to provide information, not run your life. their kids. Nature, not nurture, explains most family resemblance, so parents can safely cut themselves a lot of additional slack. Second, parents are much more worried than they ought to be. Despite the horror stories in the media, kids are much safer today than they were in the "Idyllic Fifties." Third, many of the benefits of children come later in life. Kids have high start-up costs, but wise parents weigh their initial sleep deprivation against a lifetime of rewards— including future grandchildren. Last, self-interest and altruism point in the same direction. Parents who have another child make the world a better place, so you can walk the path of enlightened selfishness with a clear conscience. A second child always undermines parents' belief in their power to mold their children, but child-rearing books hush this up because their market is first-time parents. —Steve Sailer, "The Nature of Nurture"
When we consider whether one more child is worth it to us, our calculations usually include a lot of needless parental unhappiness. Every generation of parents probably sees itself as exceptionally dedicated, but careful measurement confirms that parental effort is at an all-time high. Stay-at-home moms used to just tell their kids to go outside and play. Now, moms and dads tag along with their kids as supervisors, or servants. When we think about the effect of a child on our lives, then, we automatically picture the Spartan schedule of Today's Typical Parents. We have to give up our hobbies and nights out, we have to make our lives revolve around our kids' activities, and we have to handle all the extra cooking, cleaning, and babysitting ourselves. When kids justify foolish behavior with the excuse that all the other kids are doing it, parents try to show them the error of their ways. Few of us notice that by swallowing the high-effort standards of our peers, we are making the same mistake. Today's Typical Parents give up their independence and free time for the sake of their kids, but you still have a choice. If all the other parents were jumping off the Brooklyn Bridge, would you? My alternative is not child neglect. I spend more time with my kids than most parents. When my sons were infants, I always manned the night shift. I play with my baby every day. My older boys and I share many common interests—especially games and comic books. But most parents don't share my enthusiasm for childish pursuits, and that's fine. Diverse parenting styles deserve our respect. Some parents fill their kids' days with crafts and extra homework. That may be a good approach for them, but it is not the only good approach. More relaxed parenting styles are also on the menu—like letting your kids watch The Simpsons while you steal a daily hour of "me time." Aren't parents risking their children's future when they let Homer and Marge share the work? This self-reproach haunts many parents when they're so tired they can barely keep their eyes open, but it's overblown. Even if there were a clear trade-off between parents' present happiness and their children's future, there is no reason for parents to maximize their effort. Parents count, too, and there's nothing wrong with a happy medium. In any case, the obligation to put your children's future above your personal happiness has a lot less bite than you'd think. Adoption and twin research provides strong evidence that parents barely affect their children's prospects. If parents gave themselves a big break—or redoubled their efforts—kids would turn out about the same. Before you dismiss this claim as crazy, imagine you adopt a baby girl and raise her to adulthood. Who do you think she will resemble more by the time she graduates from high school: Her biological parents, or you? I don't just mean physical resemblance; I'm also talking about smarts, personality, achievements, values, and so on. Can you honestly say you'd be shocked if your adopted daughter had a lot more in common with the strangers who conceived her than she did with you? You don't have to merely imagine this scenario. It's been done— repeatedly. A small army of researchers has compared adoptees to their relatives—biological and adopted. They find that when adopted children are young, they resemble both the adopted relatives they see every day and the biological relatives they've never met. However, as adopted children grow up, the story has a shocking twist: Resemblance to biological relatives remains, but resemblance to adopted relatives mostly fades away. Studies that compare identical to fraternal twins reach the same conclusion. The lesson: It's easy to change a child but hard to keep him from changing back. Instead of thinking of children as lumps of clay for parents to mold, we should think of them as plastic that flexes in response to pressure—and pops back to its original shape once the pressure is released. The book explores adoption and twin research in great detail. But I'll just say that it actually fits my experience as a father. When I put my kids in the "naughty corner," they apologize for their offenses, and their behavior improves. But it doesn't stay better for long. A few hours, days, or weeks later, my sons are up to their old tricks—and back in the corner they go. Which makes me wonder: If I can't change what my sons are going to do next month, how can I hope to change what they're going to do when they're adults? Whatever your experiences, suppose for the sake of argument that adoption and twin research is sound. Then in purely selfish terms, parenting is a much better deal than it looks on the surface. If massive parental investment is the only way to turn a child into a normal adult, groaning at the thought of a new addition to the family is natural. If your child is virtually destined to become a normal adult, however, you should rethink that groan—especially if you're happy with the way you and your spouse turned out. Odds are, your kids will painlessly inherit your brains, success, charm, and modesty. The implication: Parents can give themselves a guilt-free break. Children cost far less than most parents pay, because parents overcharge themselves. You can have an independent life and still be an admirable parent. Before you decide against another child, then, you owe it to yourself to reconsider. If your sacrifice is only a fraction of what you originally thought, the kid might be a good deal after all. From Selfish Reasons to Have More Kids by Bryan Caplan. Copyright 2011 Bryan Caplan. Excerpted by permission of Basic Books.